The Brit and I visited Vezer Family Vineyards and did a full tasting of their current wine offerings. We were both very impressed. I hadn’t done a tasting there in several years and was really surprised at just how much both the vineyard and the wine-making has improved since we first started visiting in 2007. The advancement shows in the quality of their tasting menu. Before we get to the wine, let’s talk about the winery and the tasting rooms. 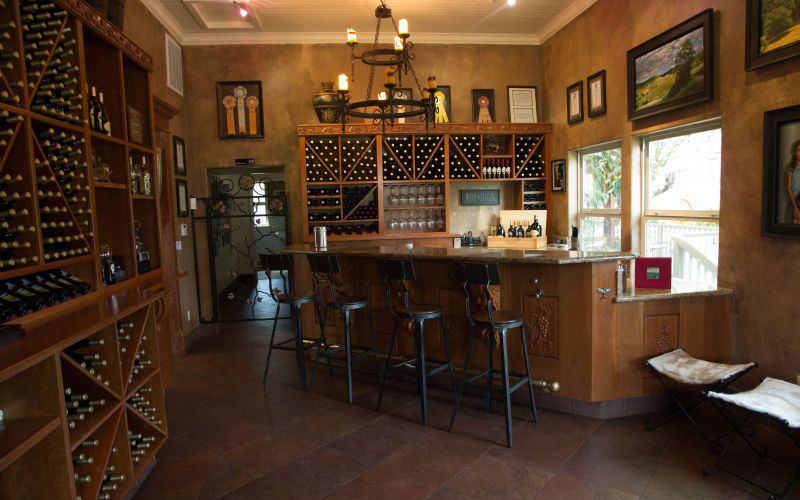 Frank and Liz Vezer have done an amazing job creating a beautiful, classy space where you can go and enjoy their wine. 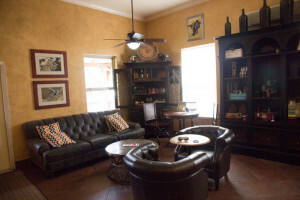 Their tasting room has a warm and welcoming feel; comfy seating, gorgeous gardens, and a well laid out bar area. Thoughtful seating has been placed around the rooms; great for gathering with friends and family, or for enjoying your wine with that special someone. We felt very lucky to have Chris as our host for the tasting. He is the Vice President of the Vezer Family Vineyards operation. He spent a great deal of time taking us through each wine and discussing with us the highlights of each taste. It was both fun and informative. He even pointed out on which part of the Vezer properties the grapes for each wine were grown. The Brit Comments: With tastings in the Napa Valley being $25 and above, the $15 charge for the tasting represents excellent value. 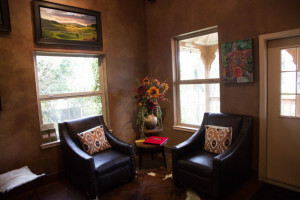 Thoughtfully placed areas to sit and be comfortable while you enjoy your wine. We started with the 2013 Estate Verdelho. This, sadly, was not the wine of my memory. It had very little nose; if anything, it had a bit of an earthy mineral scent. The flavor was crisp and dry with notes of citrus. It paired well with the almonds we were served, but it wasn’t as good as I had remembered from the summer concerts and barbecues. I was left with an acidic flavor in my mouth and felt a little disappointed. The 2011 Cabernet Sauvignon was unique in a good way. When I brought the glass to my nose I got a glorious smell of raw leather and earthiness that was something special. The taste, in contrast to the nose, was one of softness and berries. Give this a few years and it will also be silky smooth. This will be a knock out wine full of flavor and character. It could really convert me into being a Cab fan! A place to relax and lounge. Have a conversation about wine and make new friends. Vezer is a very friendly place. The 2011 Estate Zinfandel was the true star of the show for me. It had every single thing I look for in a wine; a beautiful nose full of gorgeous fruit, a fruit forward yet full bodied flavor, and a silky finish which made me beg for more. I loved this wine. I will admit to you, I have never had a bottle of Vezer red wine in the tasting room that I really loved before. There has always been that caveat of the wine needing age, or it hasn’t been my style of wine. But this “sinful zin” just knocked me off my feet. I could be happy drinking it as it is, or laying it down in the cellar for 5-10 years and bringing out something that is spectacular. The Brit Comments: Previously, Vezer Zin had been very much of a Napa style Zin with concentrated fruit flavours. Now it has a touch of European elegance, which softens it and allows the flavours to shine earlier in its life. The 2011 Jude Merlot was really what a good Merlot should be. It showed plenty of character and was nicely balanced. It had a gorgeous nose of ripe fruit. In the mouth it had a soft, supple flavor. This is the kind of wine I would serve at a casual dinner for an evening with friends. It doesn’t need fancy food to make this wine shine. Comfortable and easy describes this one well. I really loved this wine and bought several bottles. The Brit Comments: The grapes for this Merlot come from an acre of land by the Vezer’s home. Chris showed us an aerial photograph of the Vezer ranch and pointed out the small batch of Merlot grapes. This was a tasting that was not on the menu. The 2011 La Salette let me down. I have had previous years’ bottles of this wine many times and I have always liked it. This time, I didn’t even complete the tasting. For me, it just didn’t taste like La Salette. I can’t describe what exactly what was different about this particular year that was bothering me. I can’t even describe to you what notes were there or missing. All I can tell you is that it was my least favorite of this line up and left me feeling unsatisfied. The Brit Comments: I agree, in past years the La Salette has been a stunning wine; justifying the high price tag. The 2011 did not compare to my memory, nor the three wines we had just tried. The 2012 Estate Black Muscat had an amazing smell of over-ripe fruits (strawberries in particular). It is a sweet dessert wine. Although this was sweeter than I would normally drink, I could imagine using it for desserts; pouring it over ice cream or a dark chocolate mousse. It would also pair beautifully with bitter dark chocolate squares. The 2010 Late Harvest Zin rounds up our lineup with this port style fortified wine. Lovely and rich without being overly heavy. It tastes of ripe berries and cassias with a hint of licorice. Great for sipping by a late night fire after desert and coffee. The Brit Comments: This also was an off-menu taste. Update: A few days after this tasting, we were invited to have a private tasting of the 2012 and 2013 La Salette hosted by Frank Vezer himself in their Legacy room (You can get more details of this here). 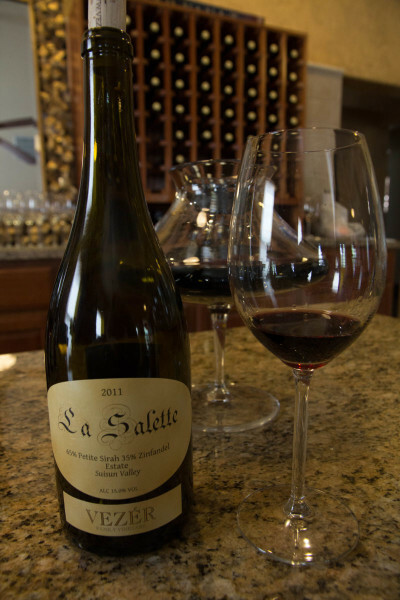 I absolutely adored the 2012 La Salette until I tried the 2013 La Salette which was, in my opinion, the best wine this winery has ever produced. I immediately handed over my credit card and bought a couple of bottles. It is just that good! I could wax lyrical for hours about the nose, the rich flavors, the smoothness on the palette despite the young age. But what I really want to say is that I just really loved this wine! For all of you out there: Get out of your comfort zone, make a little effort and get to this wonderful little winery in the Suisun Valley. You will be happy you did!